It’s been windy and wet today – not much of a day for the bees. I’d got on with the things that need doing around the farm until, late morning, I noticed a shape in the hedge some way off that caught my attention. 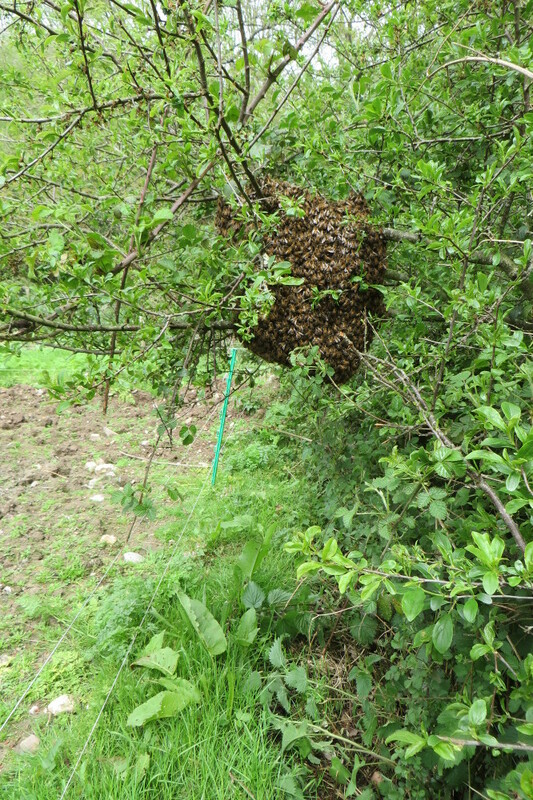 The shape turned out to be a swarm of bees, a large ‘prime’ swarm – many thousands of bees. Surprisingly I’ve not seen many large swarms in easy to view places – books on beekeeping may say something like ‘simply shake the swarm into a box and place into a beehive on a new site‘ but that’s not easy twenty foot up a house or tree… Sometimes, though, beekeeping happens as the book says. 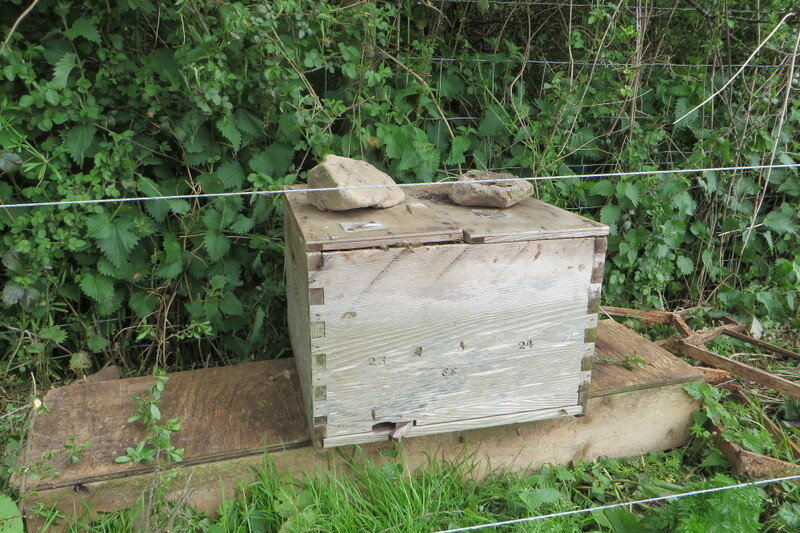 The bees must have swarmed on Monday morning, when it was warm and sunny, and got caught by the weather before they could find a new home – probably the one that a beekeeper couldn’t get at (they’re canny bees are)…. Poor things, they’d spent the night outside, just their thousands of legs holding the swarm together, as the wind and rain battered down. And today it’s still windy and wet but there they are, literally holding on, wet, battered but looking surprisingly well. Now swarms take honey with them (each bee carrying a tiny amount in its stomach) when they leave, but they need to find both a new home and be able to collect food if they are to survive and they can do neither in the wet and wind. So, lucky for the swarm, I came along! 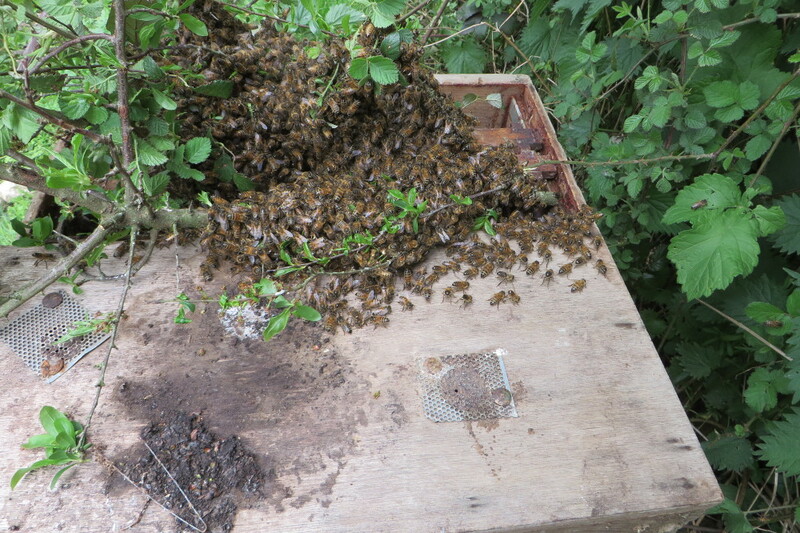 I put a empty hive (prepared with honeycombs and a little sugar syrup as food) under the swarm and carefully cut it free, placing in on the box (the swarm wasn’t as heavy as I thought – they’d eaten much of their honey supply). 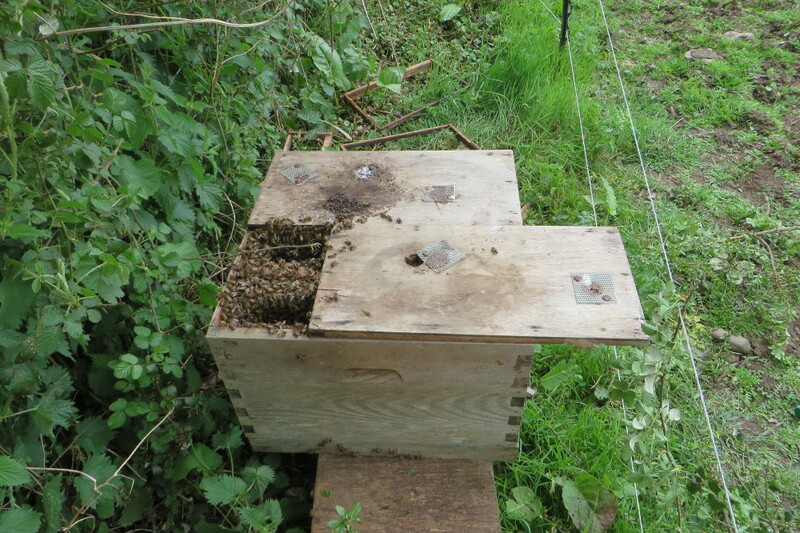 Some confusion resulted but you can see the bees starting to ‘point’ in one direction – they know a good home when they’re plonked in one! All that remained to do was carefully put the roof on and job done! But, bees are also contrary. 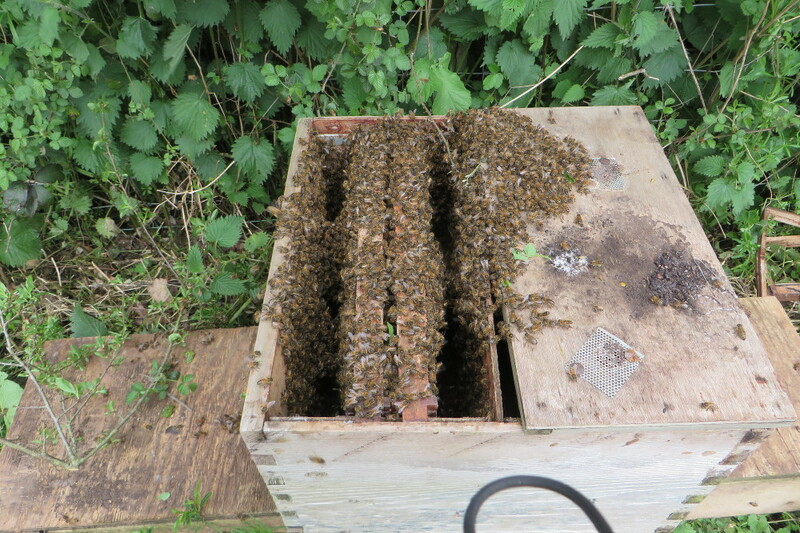 You can put a swarm in a hive and if the queen dislikes it they’ll all fly off again. Would they stay? I watched what happened, slowly more and more bees went inside the hive, and they seemed to be getting on with sorting out a new home. By mid afternoon, while the sun shone, they were busily doing what bees do – flying in and out with food. Then the wet and wind came back, hardly a bee to be seen – they’d all hunkered down in their new home. This entry was posted in Uncategorized and tagged bees by abbrookfarm. Bookmark the permalink.